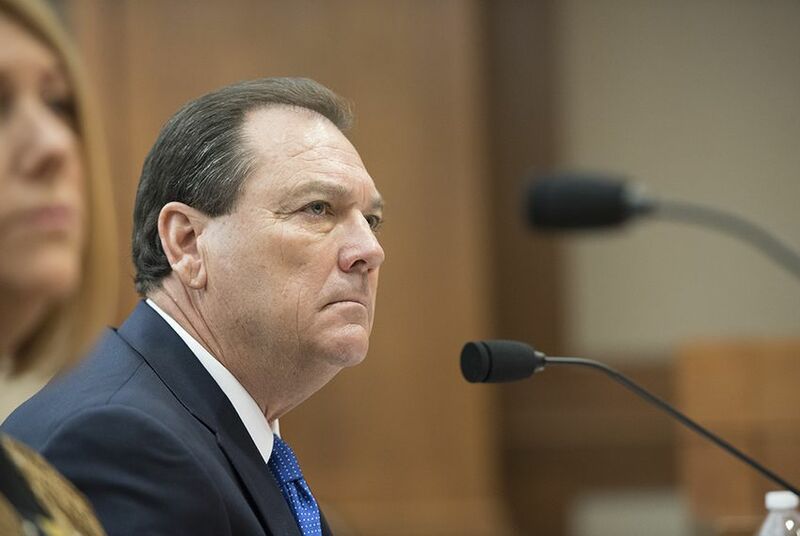 Texas Department of Family and Protective Services Commissioner Hank Whitman took another verbal shellacking on Monday as Senate Finance Committee members grilled him about his budget requests. In a scene reminiscent of a similar hearing in October, lawmakers expressed dismay that the troubled agency was still struggling to see hundreds of endangered Texas children even after receiving $150 million in emergency funding. Whitman and other DFPS officials tried to justify their budget requests for the two-year fiscal cycle and defended their use of emergency funding, which included hiring more caseworkers and bringing in law enforcement support to help find missing kids. Causing the most tension among lawmakers was Whitman's admission that even with law enforcement help, every day between 400 and 450 "priority-one" kids had not seen a caseworker within 24 hours. For example, as of Jan. 30, the agency has not had face-to-face contact with 482 priority-one children statewide, according to agency documents. Among these children, caseworkers have attempted to see 220 of them. The agency said hundreds of new children cycle into the agency’s system every day, making it difficult for that number to easily go down, but lawmakers were still unhappy with what they perceived to be a lack of progress. Sen. Jane Nelson, R-Flower Mound, chairwoman of the Senate Finance Committee, said finding priority-one children is “our highest priority.” She told Whitman that members had delivered on the emergency funding and expected the agency to deliver on several benchmarks this spring. The most important one comes May 1, when caseworkers will be expected to see 90 percent of priority-one children within 24 hours of first being notified about them. “Your agency gets a total of $3.8 billion. If I had my way, I would put all $3.8 billion into finding these kids and protecting them ... If we don’t do that, what else is important?” Nelson said. The hearing comes as budget talks get underway during the legislative session. Whitman's department has been embattled for months over reports of endangered children going unseen, children sleeping in Child Protective Services offices and overworked caseworkers. The Senate Finance Committee begrudgingly gave the agency $150 million in emergency funding in December. But almost two months later, members appear to be seeking vast improvements for goals that are not supposed to be met until later this spring and summer. Lawmakers in the House and Senate are also on edge as a federal court monitors how Texas improves its child welfare system. A pair of “special masters” have made a series of recommendations on how the state can improve, but lawmakers have not warmed up to their findings yet, saying the state should be able to make changes for the agency. During Monday's hearing, Whitman said his budget request includes an additional $109.5 million in general revenue that “focuses on critical needs on our mission to protect our children in Texas.” That includes help for Child Protective Services, foster care, day care services and adoption stipends. The funding would also go toward hiring information analysts to gather intel, hiring more caseworkers and maintaining foster care payments. The agency is hoping to hire 223 more caseworkers in 2018 and another 249 in 2019. Whitman said that while some 400 kids going unseen is “too high,” caseworkers sometimes being unable to locate some children was unfortunately part of the job. But Sen. Charles Schwertner, R-Georgetown, chairman of the Senate Health and Human Services Committee and chairman of the Senate Finance Committee’s workgroup on Child Protective Services, expressed skepticism that more caseworkers would help. He pointed to how the emergency funding was supposed to help hire 828 new staffers and Whitman’s own point that a culture shift was happening in the agency. “Why do we need to appropriate for more caseworkers when we should be retaining the ones we have?” Schwertner said. In the House, there was slightly less tension over the department's woes. The bipartisan House Workgroup on Child Protective Services held a news conference Monday afternoon to announce its own ideas for addressing the crisis. One proposal mentioned would move the Department of Family and Protective Services out from under the Texas Health and Human Services Commission to become a standalone agency, a move members say could help better organize CPS and foster care. Members also spoke about providing more financial assistance for kinship care placements and expanding community based support for foster care families. “Our goal here is to, at the end of the session, that we will have one of the best CPS and foster care systems in the country ... I think we’re going to get there,” Raymond said.